Last October, former Undersecretary of Defense for Policy Michèle Flournoy joined Michael Morell as a guest on his podcast, “Intelligence Matters.” During this discussion, the two talked about current foreign relations, policies, the current administration and the future. 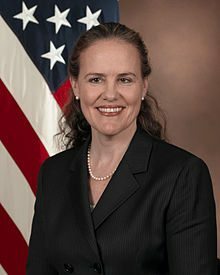 Appointed in 2009, Flournoy became the highest-ranking woman at the Pentagon in the department’s history. She described the position as a “second deputy job” in which she was responsible for supporting Secretary Bob Gates in his various efforts. The conversation then shifted to specific threats the U.S. currently faces, both foreign and domestic. Flournoy summed up President Donald Trump’s foreign policies with one word: deconstruction. It appears the current administration is more focused on deconstructing the policies and legacy of President Barack Obama (i.e. TTP, the Nuclear Iran Deal, the Paris Climate agreement) than building new efforts to benefit relations in the future, she said. Flournoy also acknowledges while various military efforts exist with potential for positive outcomes, there’s a lack of diplomatic effort to accompany them. “You have to be able to convert that military progress into diplomatic leverage that then gets you to your goals,” she said. Flournoy continues by addressing concerns about the future of the military. According to her, the military must change and evolve to maintain its edge. She lays out three obstacles that stand in the way of those changes. First is the total uncertainty and unpredictability of budget, which prevents DOD from making beneficial investment. Second is the rapid pace of advancements in technology. Cutting-edge technology has moved from DOD R&D into the commercial sector, and DOD struggles to keep up. Finally, the shift in world dynamics: Powerful competition countries such as Russia and China are rising, but government policy and military efforts don’t reflect that reality. Regarding the threats from North Korea, Flournoy says an unusual dictatorship combined with the nation’s technology advances make the threat unique. The use of Twitter for presidential rhetoric and the exchange of insults between the two leaders don’t help solve these threats, either. In fact, Flournoy said, this behavior “has heightened the sense of crisis and created an environment where the risk of miscalculation is much higher.” She explained that while U.S. military presence and efforts with our allies is a positive thing to maintain, certain actions such as flybys can be misinterpreted as an act of war. There is no easy or simple solution to this dilemma. Another threat to the U.S. is the rising power of Russia and recent actions by President Vladimir Putin. Flournoy says Putin’s No. 1 priority is remaining in power, and he’s doing so by feeding nationalism and attempting to reestablish Russia as a great power to contend with. His actions reflect another goal of his: discrediting and undermining the legitimacy of democracy everywhere. Flournoy predicts these efforts will continue as long as Putin sees no real consequences to his actions. “Expelling a few diplomats and intelligence officers and shutting down a facility or two, that’s a slap on the wrist,” Flournoy said. The U.S. can become harder in cybersecurity, working together and stopping the blame game or “pointing fingers” because that behavior further divides the nation while giving Putin exactly what he wants, according to Flournoy. To hear the full podcast, click here.